5 Plush Covered Animal Hoppers Hire for indoor use only. 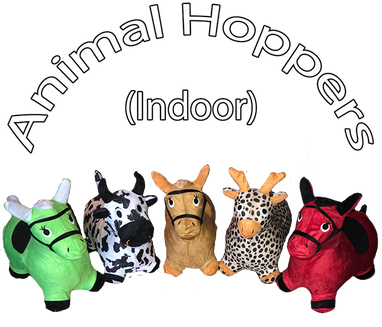 Our Animal Hoppers have been redesigned from the original & hugely popular Space Hoppers from the 70's & 80's, covered in a plush soft material, our Animal hoppers will keep your little ones entertained even off the Bouncy Castle. Our Animal Hoppers are loved by all! children up to 4 years old can use them, they are great for learning, exploring & helping to develop coordination & balance skills. Due to the material that covers these hoppers, they can only be used indoors and are available to hire alongside one of our bouncy castles. All our Animal Hoppers are thoroughly cleaned and disinfected after each use for your children's protection.